Norton toolbar still not working on my mozilla firefox 3.5 and after running live update..here is the screenshot..
Re: Where is my Norton toolbar in firefox 3.5? And the answer is right here at the top of the board you are posting on. How'd you miss it? I concur I ran the live update and the patch. Restarted the machine and still no toolbar. I get the same message. Rerunning patch tells me I am updated. Can you confirm if you ran the HotFix from the following link. The hotfix in the link give above fixes the Norton Toolbar's compatibility problems with Firefox 3.5. The tool has failed to fix the problem. Please refer to the Support page for more information. 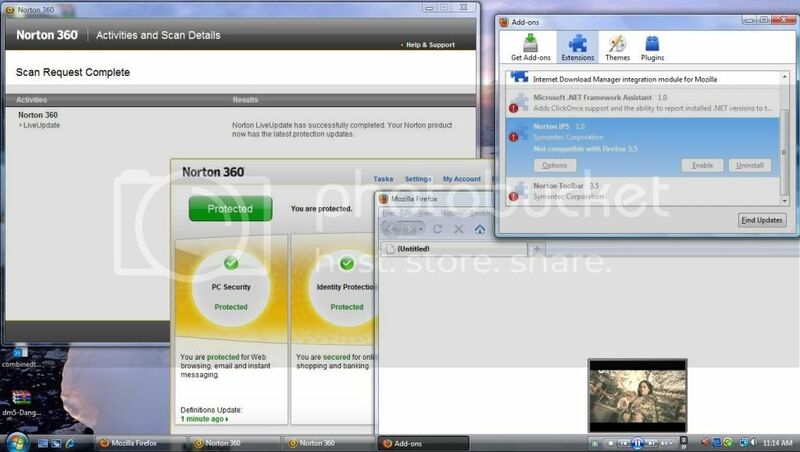 Which version of Norton 360 you are using? if it is Norton 360 2.0, please read the article given below.